ENTER THIS SECTION to see the varied and ever changing selection of Midcentury and modern Danish made Bookcases in a variety of lovely woods. ENTER THIS SECTION to see the varied and ever changing selection of Midcentury and modern Danish made cabinets in rosewood. There will be a varied selection of long sideboards, wall units and similar storage cabinets all in rosewood. Some will be made by the well known and famous Danish architects / designers as well as lesser known generic Danish furniture manufacturers. 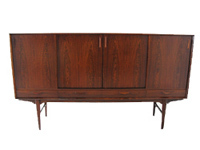 ENTER THIS SECTION to see the varied and ever changing selection of Midcentury and modern Danish made cabinets in teak. ENTER THIS SECTION to see the varied and ever changing selection of Midcentury and modern Danish made cabinets in blonde scandinvain oak. Selection of Midcentury modern wardrobes made and designed by Danish furniture makers. Available to view in store at Danish homestore in Nottingham. We sell Danish furniture! ENTER THIS SECTION to see the varied and ever changing selection of Midcentury and modern Danish made chests of drawers in a variety of lovely woods. There will be a varied selection of small bedside chests, larger gentlemans dressers and a mixture of periods and styles. Some will be made by the well known and famous Danish architects / designers as well as lesser known generic Danish frniture manufacturers. ENTER THIS SECTION to see the varied and ever changing selection of Midcentury and modern Danish made bureaus and writing bureaus. There will be a varied selection of bureaus some in teak, others in oak and occasionally in the lovely Brazilian rosewood.